June is upon us and that means that school is out or very close to being out. The end of the school year was always one of the most anticipated days of the year for me because it meant that there would be weeks of getting up when I wanted to and spending all day riding bikes or playing in the creek or playing baseball. It seemed like the only thing that would interrupt the daily adventure was the chorus of Mom’s yelling from front porches that it was time for dinner. But before school ended for the year, there was another much-anticipated day: field day. Field Day was a day that, most importantly, did not involve having classes and, almost as importantly, involved games all day long. Among the contests was the fifty yard dash, the long jump, the running long jump, the hop, step & jump, free throw and high jump. This was the chance to compete against everyone in your grade to see who was the best. And if you were lucky you won first, second or third place ribbon. I am an admitted pack rat and recently I came across my vast collection of field day ribbons that I won. Well maybe it was a modest collection of field day ribbons. Okay, it was actually a very small collection of ribbons that I won on Field Day. I do not recall which grades participated in field day. Let’s just assume that it started in fifth grade, that would mean there were 4 years when I participated: 5th, 6th, 7th and 8th grade. Over all that time I managed one first place ribbon and three third place ribbons. So, I was not the best athlete in my class, not even close. It becomes even less impressive when I admit that I only won ribbons in two events. There were two third place ribbons in the hop, step & jump and a first and third place ribbon in the free throw. Now if there was a contest where I had to hop, step, jump and shoot a basketball, perhaps I could have really excelled at that one. So, it is rather obvious that I was never a great athlete. Honestly, I have to admit that I never looked like much of an athlete. Perhaps it was that I was one of the youngest kids in my class, perhaps it was that I was a skinny kid of slightly below average height, perhaps it was the glasses that I wore from third grade on. Whatever it was, my presence just never screamed “athlete.” I was not the kid that was picked first for any team. (I was also not the last kid picked for teams either.) It seemed like this even followed me to college when I signed up for a softball class and the first day of class we divided up into two teams and I was one of the last ones assigned (chosen) to a team. But the way I did get an “A” in the class. These days, I would be thrilled if I could run, throw, hit, etc. like I did when I was younger. Athletically, my best days are behind me and they were never that great to begin with. 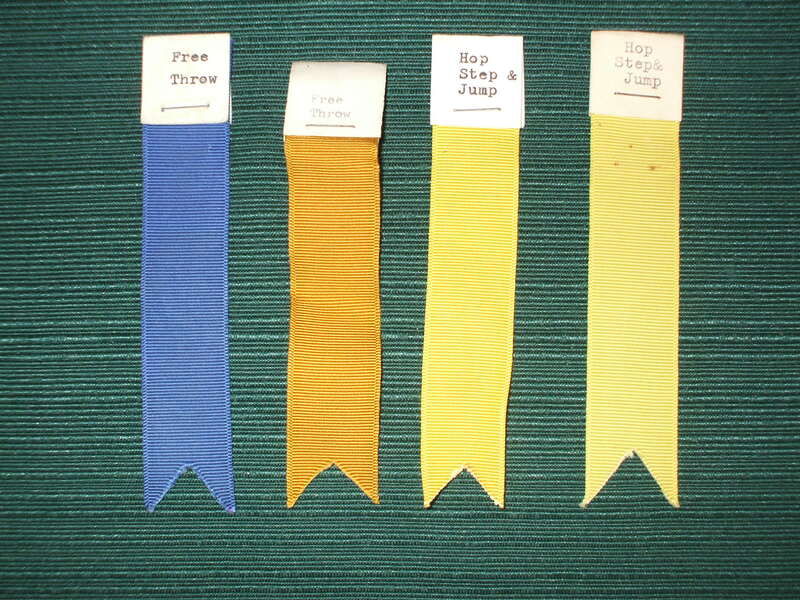 So I have tried to hang onto any evidence of athletic achievements, even if they are just a few faded ribbons from field day during elementary school. This entry was posted in Humor and tagged Field Day on June 2, 2015 by Leonard. Odd as it may seem, your post today is highly similar to the thoughts that I had as my wife and I attended the Stones concert at Ohio Stadium this past Saturday. You’re too modest, Leonard. Think of it this way–it’s not how you start, it’s how you finish. And you are finishing by running marathons. How many of your classmates can say that!